Dr. Kushner is the John M. and Jeanne C. Flesch Professor in Gynecologic Oncology. He completed his four-year residency in obstetrics and gynecology at Northwestern University Prentice Women's Hospital. After finishing his residency in 1998, he went on to the Cleveland Clinic Foundation and performed a three-year clinical and research fellowship in gynecologic oncology. He is a Fellow of the American College of Obstetrics and Gynecology and holds board certification in obstetrics and gynecology as well as gynecologic oncology. 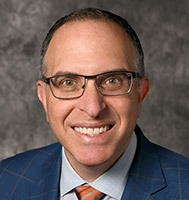 Dr. Kushner joined the University of Wisconsin Carbone Cancer Center in 2001 and is a nationally recognized specialist in minimally invasive surgery for gynecologic cancer, including robotic hysterectomy and trachelectomy. Dr. Kushner is an expert in postoperative pain management and fertility/menopause-sparing surgery. More recently, he has turned his research focus to minimizing the negative impact of cancer and subsequent treatments on patients' quality of life. He is the Chair of the Scientific Network on Female Sexual Health and Cancer, an international consortium of leading researchers dedicated to the scientific pursuit of improving sexual health for women after a cancer diagnosis, and hosted the group's charter meeting in Madison in May 2012. He is the primary investigator on multiple studies evaluating sexual health among gynecologic cancer survivors, as well as studies aiming to decrease pain and improve mindfulness after cancer treatment. He is the Principle Investigator for the Gynecologic Oncology Group at Wisconsin and runs a large clinical trials program for the Division. Dr. Kushner developed the curriculum for endoscopic education for the University of Wisconsin Department of Obstetrics and Gynecology. He has studied and written on the impact of both standard simulators and computer-based training on laparoscopic surgical education. He has won multiple teaching awards from learners. Dr. Kushner holds numerous national positions in the Society of Gynecologic Oncologists, Gynecologic Oncology Group (GOG) and the American Association of Gyn Laparoscopists. He is also an ABOG examiner for the oral gynecologic oncology board exam and writes questions for the written exam as well. Dr. Kushner has co-authored more than 25 peer-reviewed journal articles, authored textbook chapters for future learners and is frequently invited to speak nationally for various medical organizations. Dr. Kushner's research interests relate to the surgical and chemotherapeutic management of gynecologic malignancies. Areas of focus include laparoscopic techniques, fertility and hormone preserving cancer treatments, ovarian cancer chemotherapy and quality of life research.